In Chapter 1 we saw how a momentum exchange tether works. When an orbiting spacecraft vertically deploys a long cable with a mass at the end, and that cable is subsequently cut, the spacecraft moves into a new orbit. This orbit has either a higher or a lower average altitude than before (it will be an elliptical orbit), depending on the direction in which the mass is initially pushed away. The deployed mass also enters a new orbit; if the mother spacecraft goes up into a higher orbit, the mass or subsatellite will go down into a lower orbit, and vice versa. Momentum exchange tethers can thus be used to alter the orbits of satellites without propulsion, just by using the momentum of the cable. We have seen that the concept has already been validated by the experimental Small Expendable Deployer System (SEDS-1) and YES-2 missions, where the momentum exchange principle was used, respectively, to de-orbit a spacecraft and to return a small reentry capsule (as described in section Satellite Experiments in Chapter 4). An operational application could be the use of YES-2 type equipment on the ISS. Some research performed onboard this large orbital laboratory requires samples of biology and material science experiments to be returned to Earth for further analysis. Currently such samples can only be flown back by the large Space Shuttle, or alternatively by the Russian Soyuz, which is rather small and consequently has little storage space. Both vehicles visit the station for crew exchanges and resupply only a couple of times a year, so the opportunities to return anything to Earth are relatively rare. When the Space Shuttle is phased out in 2010 (as currently planned), for a couple of years only the Soyuz will be available for cargo return (the uncrewed transportation vehicles Progress and ATV cannot return to Earth intact, but instead are destined to burn up in the atmosphere after delivering supplies to the ISS). NASA's new Orion crew capsule will also have only very limited cargo space. Especially with biology experiments, samples often deteriorate quickly and thus need to be flown back as soon as possible after completion of the onboard experiment. The small company Delta-Utec has proposed a Space Mail system, similar to their YES-2 demonstrator, which could be used to de-orbit sample return capsules using a swinging tether. The Space Shuttle or other large launch system could deliver a number of such capsules together with a single tether deployment system to the ISS. When needed, a capsule could be hooked up to a tether and returned to Earth. As a capsule would be swung to a sufficiently lower altitude for de-orbiting, in reaction the ISS would simultaneously enter a slightly higher orbit (momentum exchange). The Space Mail system would thus also provide a free reboost to the station, partly compensating for the orbit deterioration caused by the tiny but continuous atmospheric drag force present at the nominal orbital altitude of the ISS. Reboosts are currently performed using the station's own rocket orbital maneuvering system as well as the more powerful thrusters of visiting Progress and ATV cargo spacecraft, but they cost a lot of propellant. Unfortunately, the stringent safety rules imposed after the tragedy with Space Shuttle Columbia and the very tight budget available for future ISS operations and developments do not offer much hope for the implementation of a Space Mail system on the station. The risk of a return capsule accidentally colliding with the ISS or a tether wrapping itself around the station will probably be too high; in addition, no money is set aside for the development of the system, and there is no launch slot available in the current ISS flights planning. An idea for a much more advanced momentum exchange tether system is what tether enthusiasts call a "bolo"—a free-flying, rotating tether system that could be used to transfer spacecraft to higher orbits. The name is probably derived from the bolo or more correctly bola, a throwing rope with weights at both ends that is used to hunt animals by ensnaring their legs. Imagine an extremely long cable, 100 km (60 miles) or more in length, in an elliptical orbit and spinning vertically like a sling. On one end it has a large ballast mass and on the other a spacecraft catching and docking device. Because the ballast has a much higher mass than the rest of the cable, the center of mass and thus the center of rotation lies close to the ballast mass. 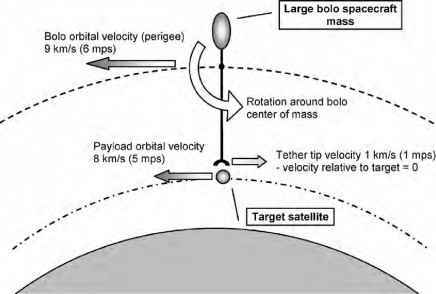 If the tether's rotation is timed just so that when the bolo reaches its perigee the tether is vertically straight below the bolo's main body and swinging backward, it is possible to match the velocity of a target satellite that is moving slower (Fig. 5.5). Figure 5.5: A backward-rotating bolo tether tip could match its velocity to that of a spacecraft on a suborbital trajectory and then catch it. swinging by at low altitude, the payload spacecraft hooks itself to the tip's docking clamp (or is actively caught by the bolo). Half a tether rotation later, when the tip with the docked spacecraft reaches its maximum altitude, the satellite is released at a higher velocity (the bolo's orbital speed plus the tip's rotational speed) and thereby tossed into a higher orbit (Fig. 5.6). For this to work, the bolo needs to follow an elliptical orbit and catch the target spacecraft when it is moving through its perigee; only then can its orbital velocity be higher than that of a satellite in a lower orbit. As we have seen in the section Orbits in Chapter 1, a satellite in a high circular orbit moves slower than one in a lower circular orbit. in a high orbit at the peak of the cable's rotation, and subsequently releasing it into a lower orbit. This concept would be useful for catching interplanetary spacecraft coming back to Earth (for example, the reentry capsule of a Mars sample return mission), and putting them into orbits around Earth. With a series of tethers, such a spacecraft could then be brought down into a low Earth orbit and made to fall into the atmosphere in order to land on Earth without using any onboard propulsion system (which would otherwise have to be flown all the way to Mars and back, resulting in a heavy mass penalty). 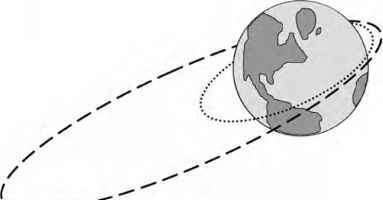 When a ''catching'' bolo is put in orbit around the Moon or another planet like Mars, it could be used to grab an incoming spacecraft launched by another, ''throwing'' bolo system in orbit around Earth. In this way, an interplanetary transportation system could be created, as was shown by Robert L. Forward in a scientific paper he published in 1991. The concept has been further developed by him and Robert Hoyt for their company, Tethers Unlimited, as the Mars-Earth Rapid Interplanetary Tether Transport (MERITT) System. Since the Moon has no atmosphere, a bolo in lunar orbit could even go one step further than putting payloads in lower orbits: it could place spacecraft directly onto the lunar surface! In 1978 tether pioneer Hans Moravec proposed a lunar ''skyhook,'' also known as a ''rotovator,'' consisting of a massive central facility and two very long tether arms in rotation (the idea was based on the original Earth-orbiting skyhook concept of Dr. John McCarthy, who invented it as an alternative to the space elevator in the early 1950s). These tethers would have the same length as the orbital altitude of the central facility, and during the system's rotation their tips would thus periodically reach the surface of the Moon. The rotovator would rotate in the same direction as its orbit, and at such a rate that the velocity of each tether's tip would be equal to the orbital velocity of the system's center of mass, that is, the center facility. When swinging down backward and reaching the lunar surface, a tether tip's velocity relative to the Moon would thus be zero; as a result it would be able to gently place an object on the ground or pick it up. The tether arms could be thought of as spokes on a giant wheel rolling over the Moon (Fig. 5.7). Tip rotating forwards at orbital velocity of bolo center - effective speed is double the orbital velocity! Tip rotating backwards at orbital velocity of bolo center - effective speed is zero! Figure 5.7: A lunar rotovator could gently place payloads onto the surface of the Moon, or pick them up and launch them to Earth. rotate around the common center of mass, but as long as the distance from the grappling end of the tether to the rotational center is the same as from there to the surface, the system should work okay. Rotating and orbiting the Moon, a lunar rotovator, or "lunavator" with one or two arms could capture payloads flying in from Earth and set them down onto the surface of the Moon. At the same time it could pick up cargo from the Moon and half a rotation later send it to Earth, by releasing the cargo at a tether tip velocity that is twice the center facility's orbital velocity. Although the rotovator never stops spinning, due to the gigantic scale and because its tip will have zero horizontal velocity with respect to the surface, people on the ground will not perceive it as a rotating tether. To them it will look like a long cable reaching straight down vertically from the sky, then retreating back up exactly the same way. Depending on the tether length and the rotation speed (the combination always needs to be selected so that the tip speed at the lunar surface is zero), lunavators can be made to periodically touchdown at the same single spot, at several fixed spots or at any number of varying locations every orbit. For transportation to and from a moon base, we may want one that drops by once every orbit. However, a rotovator that makes multiple rotations per orbit could service more than one lunar station. We may also use the tether as a kind of helicopter that picks up a payload at one site and then, after one or multiple rotations, drops it at another surface location without releasing it into space. Normally the time available for the rotovator to deposit and pick up payloads on the lunar surface would be very short, on the order of seconds. However, by deploying additional cable from a reel at the tether tip and with the help of rocket thrusters, cargo could be landed ahead of when the tip would normally arrive on the Moon. Likewise, after the normal and very short touchdown time has passed, the grapple system at the end of the tether could be kept on the surface for a bit more time by unreeling cable as the main tether starts to pull away. This technique could lengthen the time available for docking and undocking cargo to several minutes, making the concept much more practical. 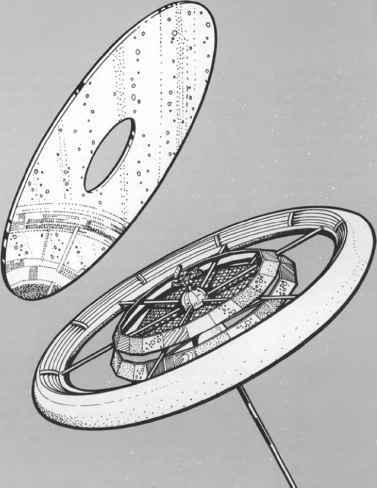 A rotovator, the name now commonly used for any low-orbiting bolo, could in principle be used on any planet or moon. However, when there is an atmosphere the tether arm will have to move through it at very high velocities, creating a lot of aerodynamic drag and heat that could easily burn the tether through. A rotovator orbiting Earth reaching all the way to the planet's surface is therefore very probably unfeasible. Of course there is a catch in the use of momentum exchange tether launch systems: the momentum and kinetic energy that a released spacecraft gains have to come from somewhere. 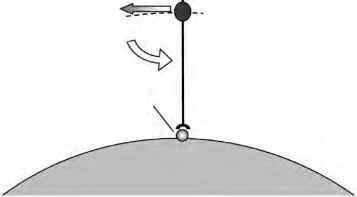 The source is obviously the bolo or rotovator; a spacecraft thrown into a higher orbit steals momentum from the rotating tether system, which itself therefore ends up in a lower orbit. There is no energy creation in this system, only a transfer of kinetic energy from the bolo tether to the satellite. The higher its own mass in comparison to the payload mass, the less a bolo's orbit will be affected by picking up or launching cargo. To prevent it from entering Earth's atmosphere or crashing onto the Moon, a bolo or rotovator thus needs to have a high mass relative to the mass of the individual payloads it handles. Moreover, the increase in velocity and orbit altitude that it is able to give to its released cargo is very limited if the tether system's mass is not considerably higher than that of its payload. lunavator could pick up containers full of rocks or water directly from the Moon and haul them up to its ballast mass station. Nevertheless, after launching one or more satellites (depending on the spacecraft masses, tether mass and length, initial orbit, etc.) a bolo tether will eventually get too close to the surface or atmosphere of the planet or moon it orbits. This could be prevented by using a rocket propulsion system to push it back into its original orbit, but that would nullify most of the benefits of using a bolo system. However, as with the Debris Shepherd, the bolo could be turned into an electrodynamic propulsion tether by lining it with metal wire and running an electric current through it. This current could be generated by equipping the bolo ballast mass with solar arrays. The Lorentz force caused by the interaction of the electric tether's magnetic field with Earth's own magnetic field would then provide a small but steady push, sufficient to propel the bolo tether system back into a higher orbit. The same Lorentz force could also be used to initiate or increase the bolo's rotational speed, because as long as the center of mass of the bolo is not exactly in the middle of the tether, the electrodynamic force will cause an acceleration of the rotation rate. However, it would not be needed to adjust the rotational velocity during operation, because catching and throwing payloads does not affect the rotation rate of the bolo. If this is somewhat hard to imagine, remember that at the moment of rendezvous the velocity of the target spacecraft and the tether tip are the same; they simply connect without changing their velocity. This concept of combining a momentum exchange tether with an electrodynamic propulsion tether for transporting orbital payloads was invented in the late 1980s by Dr. Robert Hoyt of TUI. He called it a Momentum-eXchange/Electrodynamic-Reboost (MXER) tether system. The great benefit of this system is that it can swing satellites into higher orbits and then replenish the transferred orbital energy—all without using any propellant. The MXER can give a spacecraft the equivalent of a high-thrust impulsive rocket burn, putting it into a much higher orbit in a very short time with a powerful burst of momentum exchange. Then it can slowly reboost its own orbit over several weeks or longer. The energy required for the MXER ultimately comes from the Sun and is thus available in space for free; sunlight is converted into electricity by the MXER's solar arrays, subsequently turned into orbital energy by the electrodynamic tether, and then transferred via momentum exchange to a target satellite that uses it to reach a higher orbit. The practical use of electrodynamic tether propulsion around our planet is restricted to orbits lower than an altitude of about 1000 km (600 miles), because only in that region is Earth's magnetic field strong enough and the ionosphere dense enough to generate a sufficiently powerful Lorentz force. The elliptical orbit of a MXER tether must therefore have a perigee fairly close to Earth. As we have already seen in the description of how orbits work, propulsive boosts near an orbit's perigee will increase the apogee altitude but not the height of the perigee itself. As long as a MXER has a perigee below an altitude of 1000 km (600 miles), it will thus always be able to reboost itself. However, if the orbit is very elliptical and the apogee very high, the bolo spends little time near its perigee and is thus only able to use electrodynamic propulsion for a short time each orbit. That means that MXERs intended for use at high altitudes, such as those at the end of a series of bolos that are used to sling payloads into interplanetary orbits, may require long reboost times. Another drawback is that electrodynamic propulsion cannot be used for tethers in orbit around the Moon or Mars, because these have extremely weak magnetic fields. Bolo tethers in orbit there would have to raise their orbits by other means. Using chemical rocket propulsion does not make much sense, because most of the benefit of not having to use any propellant to change the orbits of the target spacecraft would then be lost. Instead solar electric propulsion may be used, which uses sunlight turned into electrical power by onboard solar arrays to run ion thrusters. It does require propellant, but much less than conventional chemical propulsion systems (see Rocket Propulsion Limits and Limitations in Chapter 2). However, if a bolo tether's own orbit is lowered when it throws out a spacecraft, its orbit is raised when it catches an incoming payload and releases it into a lower orbit. A bolo or rotovator circling the Moon could thus maintain its orbit by throwing and catching equal amounts of payload; sending cargo to Earth lowers its orbit, but catching and releasing incoming spacecraft from Earth subsequently increases it again. In this concept, there is no need for propulsion on the tether. Adjustments in the bolo's orbit could even be made by varying the masses thrown and caught according to the intended increase or decrease in orbital altitude. The most difficult part of the bolo concept is the rendezvous between the tether tip and the target spacecraft. Not only must the tether swing down into the target's orbit exactly at the moment that the spacecraft is at the right position, but the tip and the target must also move exactly at the same speed in exactly the same direction. Only then will the catching device on the tether be able to grab the spacecraft. Since the orbit of the bolo and that of the spacecraft are different and the tether itself is also rotating, the amount of time for docking the target to the tether's tip is very, very short. In contrast, the Space Shuttle docking to the ISS is an extremely slow process. The shuttle carefully maneuvers to match the orbit of the station in terms of direction, speed, and acceleration. Docking requires a precision of millimeters in position and millimeters per second in velocity. A bolo tip docking to an orbital spacecraft will only be able to match position and velocity for a very short time, as the acceleration rates will never match due to the different orbits and tether rotation. If the docking device does not connect to the spacecraft in an instant, they will inevitably move away from each other. As described earlier for the lunar rotovator, the use of mechanisms to reel in or out the last part of the tether and rocket thrusters on the grappling mechanism may be able to somewhat prolong the time available for docking. However, since in orbit there is no fixed ground, like on the Moon, and as the target spacecraft is moving, rendezvous times will remain very short— probably on the order of tens of seconds. Capturing a satellite with the tip of a rotating bolo tether will be about as difficult as sitting in a rollercoaster and trying to catch an egg thrown up at you from a moving car. Passing on payloads from one tether to another in a series of Earth-orbiting bolo systems will be even more tricky, as the orbits of all the individual tethers need to be closely aligned; they must lie in exactly the same plane, and the tip of each tether must swing by exactly at the right time and position at the bolo's perigee to be able to catch the target satellite. The problem is that Earth is not a perfect sphere. The resulting small variations in gravity at the same altitude make orbits change continuously. If two tethers in a bolo series start out orbiting in the same plane but at different altitudes, their orbits will immediately start to move so that they no longer share the same orbital plane. Moreover, if their perigees were initially right above each other, the nonhomogeneous gravity field will move them so that very soon they will not be close to each other anymore (Fig. 5.8). 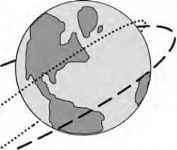 The changes in orbit plane can be prevented by putting all tethers in equatorial orbits (orbits above the Earth's equator), but the movements of the perigee positions cannot. This will make the passing on of payloads from one bolo to another extremely difficult and does not leave much room for mistakes; if an orbiting target satellite is missed by a tether tip, its continuously changing orbit and that of the bolo may not allow another catch opportunity. To stay in the spirit of the previous analogy, this is about as difficult as trying to pass an egg from one rollercoaster to another, with each rollercoaster bolted to a rotating platform. Figure 5.8: Two initially compatible bolo orbits will soon evolve so that they no longer lie in the same plane. propellant. If trajectory measurements show that a spacecraft will arrive at the wrong moment or place to be caught by a bolo, its orbit may be adjusted slightly to offer a better rendezvous opportunity. The development of a tether tip grappling system able to quickly connect to a target spacecraft is also a major challenge. In the spring of 2005, engineers from NASA's Marshall Space Flight Center and faculty and students from Tennessee Technological University tested one solution for this problem. They came up with a concept involving a boom on the target spacecraft and a box-like structure on the end of the tether. When the boom goes through an opening in the box, a mechanism inside latches onto hooks on the end of the boom. When the satellite needs to be released, the spacecraft reverses the hooks on the boom and falls away. Testing of this system involved a simulated satellite of about 12 kg (25 pounds), equipped with a stabilization gyroscope, batteries, sensors, and a camera. To simulate the free-fall conditions in space, the payload was shot up from the floor to the box and then grabbed in midair by the catch mechanism hanging from the laboratory ceiling, about 10 meters (30 feet) off the ground. With nearly 50 successful catch demonstrations, the testing successfully demonstrated the viability of the technique. Tethers Unlimited has proposed a small experimental tether system to address some of the challenges facing the development of a MXER. This Microsatellite Tethered Orbit Raising Qualification Experiment (^TORQUE) system is designed to fly as a secondary payload on the upper stage of a large rocket. After the launcher has released its primary payload into GTO, the ^TORQUE system bolted to the stage releases a microsatellite at the end of a high-strength conducting tether with a length of 20 km (12 miles). 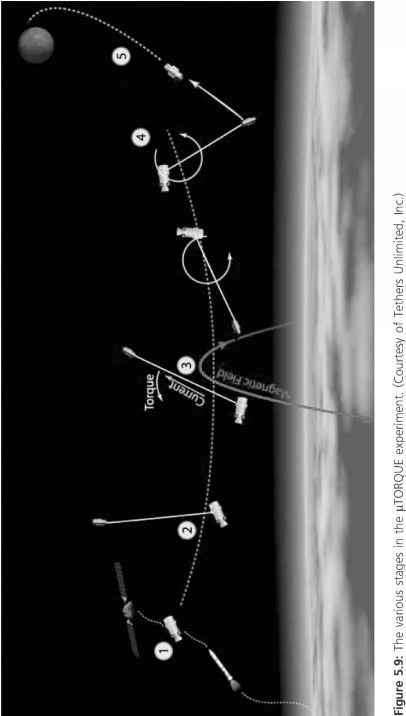 Using electrodynamic drag during several perigee passes in the highly elliptical GTO orbit, the tether is spun up. Using electrodynamic drag rather than electrodynamic propulsion for this means that no power supply is required, keeping the system as simple as possible (effectively some of the orbital energy of the stage is converted into rotational energy). In addition, the electric energy generated by the conducting tether can be used to power the system's electrical equipment. When the tip with the microsatellite reaches a velocity of 0.4 km per second (0.2 miles/s) on top of the system's orbital velocity, the satellite is released during a perigee pass. The extra speed will increase the apogee of the small spacecraft so much that it should be possible for it to reach the Moon! The baseline ^TORQUE system, with a total mass of 20 kg (44 pounds), could put a 80-kg (175-pound) satellite into a lunar transfer orbit (Fig. 5.9). The benefits of systems like the MXER and similar bolo momentum exchange tethers are that they enable large orbit changes with (near) zero propellant usage (unlike conventional rocket propulsion), offer short orbital transfer times (unlike solar electrical propulsion), and can be reused (unlike any type of propulsion requiring propellant). Moreover, they can be tested in space on dummy payloads before being employed to transfer real spacecraft. example. Many bolo systems in various orbits may thus be needed to serve all possible satellite orbit requirements. Complicated momentum exchange tether systems still have a long way to go before they can be considered operational technology. The costs of their development and deployment into space probably mean that they will be economical only if they are used for transferring many spacecraft on a regular basis. However, if we require continuous transportation of cargo or astronauts between a lunar base and Earth, tethers may prove to be a superior solution.